Betty Balfour (born in London on 27 March 1903) was the only international star of the British silent cinema, the most popular actress in Britain in the '20s and in 1927 named by the Daily Mirror as the country's favorite world star. Gamine-like, she was a consummate screen actress, whose sympathetic portrayals were often tinged with pathos. Her talent was most evident in the 'Squibs' comedy series produced by George Pearson , while in his Love, Life and Laughter (1923) and Reveille (1924), she demonstrated a serious side to her character. The partnership ended after Blinkeyes (1926), when Pearson 's offer to divorce his wife and marry Balfour was rejected by the actress. She made her stage debut in 1913, and was appearing in Medora at the Alhambra Theatre when T.A. Welsh and Pearson saw and signed her for Nothing Else Matters (1920). After replacing Gertrude Lawrence on stage in The Midnight Follies, Balfour was back with Pearson with her first starring role in Mary-Find-the-Gold (1921). She was equally popular on the Continent, starring in the German films, Die sieben Töchter der Frau Gyurkovics (Germany, d. Ragnar Hylten-Cavallius, 1927) and Die Regimentstochter (Germany, d. Hans Behrendt, 1929); she starred for Marcel l'Herbier in Le Diable au Coeur (France, 1927), for Louis Mercanton in Monkeynuts (France, 1928) and for Geza von Bolvary in Bright Eyes (Austria/UK, 1929). 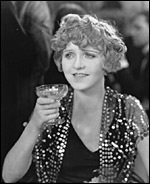 Back in Britain, she also starred in Alfred Hitchcock 's Champagne (1928). Balfour's sound debut, The Brat (d. Louis Mercanton, 1930), based on the 'Squibs' character, was only moderately successful, and her popularity waned in the talkies. 'Britain's Queen of Happiness' was anything but happy in her private life: her 1931 marriage to composer Jimmy Campbell ended in divorce in 1941; and, after a failed stage comeback in 1952, she attempted suicide, and was a recluse for the last 20 years of her life.